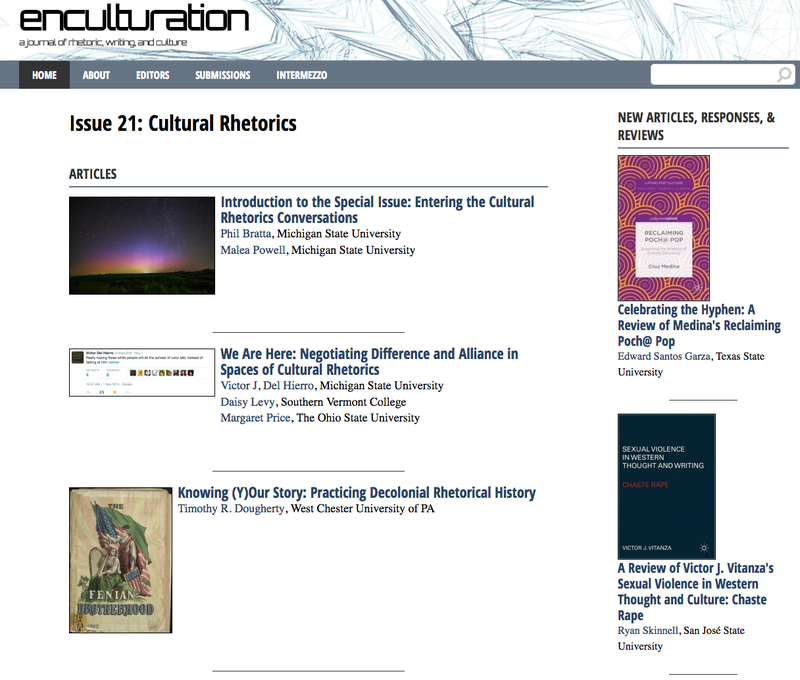 In the most recent issue of Enculturation: A Journal of Writing, Rhetoric and Culture, Edward Santos Garza reviews my book Reclaiming Poch@ Pop: Examining the Rhetoric of Cultural Deficiency (Palgrave 2015). I really appreciate Santos Garza's generous reading of my book and the great work by the special guest editors, Malea Powell and Phil Bratt. There are also some great articles by Victor del Hierro as well as Alexandra Hidalgo's call for documentary filmmaking in cultural rhetoric. "more than maybe any scholar thus far, devises fresh ways of understanding pochx rhetoric. For an American academy seeing larger numbers of Latinx students, many of whom fit Medina’s idea of a pochx, this text’s project is much-needed, one that should serve rhetoricians and compositionists alike."